The language function is informative (representing objects and facts). ‘Plain communication of facts’: information, knowledge, opinion, etc. The language dimension used to transmit the information is logical or referential, the content or topic is the main focus of the communication. The form of language is logical. The text focus is content-focused. The translation method is plain purpose, explicitation as required. The example of the text is reference work, report, lecture, journal, etc. The language function is expressive (expressing sender’s attitude). Creative composition’: the author uses the aesthetic dimension of language. The author or sender is foregrounded, as well as the form of the message. The form of language is aesthetic. The text focus is form-focused. The translation method is ‘identifying’ method, adopt perspective of ST author. The example of the text is poem, play, biography, etc. The language function is appellative (making an appeal to text receiver). The aim of the appellative function is to appeal to or persuade the reader or receiver of the text in a certain way. The example of the text is advert (to buy a product), and agree to an argument. The form of language is dialogic. The text focus is appellative-focused. The translation method is adaptive, equivalent effect. 4. Audio-media text. The example of the text are film and visual and spoken advertisement. 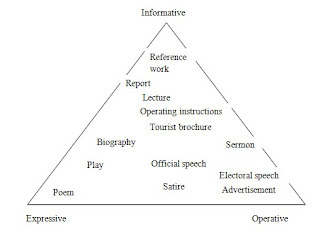 Atkins (1992: 2) stated that texts sources for translation output is from small in newspaper or magazine, journal, book, poem, published correspondence. According to Atkins, Journal is one of the source texts. 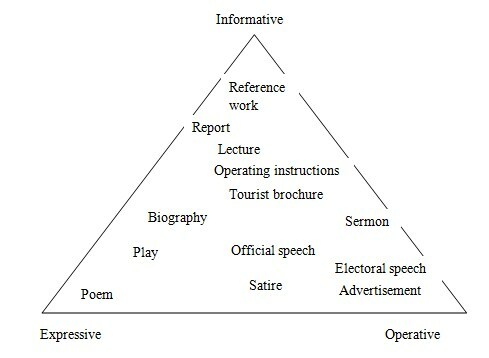 By the main characteristic of each text type above (Reiss, 1977: 108-9 in Munday, 2012:112), journal involve to the informative text type (reference work and report). In short, Journal is suitable to assess the output of CAT Tool. In other text type, the expressive text type has expressive function and the language form is aesthetic. Moreover, operative text type has appellative function to appeal and persuade the reader. Meanwhile, informative text type has informative or content-focused. In the CAT Tool translation, it more emphasize on content rather than aesthetic and appellative.